Faithful friends of the festival have made an invaluable contribution to further secure exground filmfest’s financing: since 2009 each of them donates EUR 100 and enables us to endow the award in our International Short Film Competition with a prize money of EUR 1,500. Our very special thanks for that! With this generous support the circle of exground friends has shown representative for our audience that it is not just our deepest wish to secure exground filmfest’s traditional place in the calendar of culture for many years to come – and continue getting first-class films to Wiesbaden. This is getting increasingly difficult, as competition for getting the best productions increases and screening fees rise sky-high. 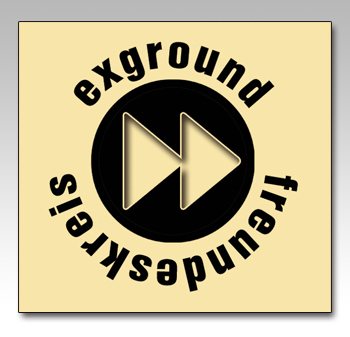 Support exground filmfest as member of the circle of exground friends with a yearly contribution of EUR 100! As a member of the circle of exground friends you are invited to the opening- and closing ceremonies, the festival receptions and, of course, the screenings of the International Short Film Competition at Caligari FilmBühne. To shorten the time between the festivals, you get free admission to our series “exground film of the month”, taking place each last Wednesday a month at Caligari FilmBühne. If you would like to join the exground circle of friends, please write to us at freundeskreis@exground.com or call us at +49 (6 11) 1 74 82 27.